My Favorite Spot is on 449 Westcott Road, Danielson, CT. It is a quiet peaceful relaxing place, the Church of the Nazarene where many memorable moments have taken place. Warm Friendships are always welcomed to you by the Pastor and members to help you rest from hard day trials and encouraging messages of hope and peace and lasting impressions to guide me through another week of trials that may come my way. At the end of service, I grab a cup of coffee and enjoy the fellowship or make a new friend. I have been receiving a lot of good program ideas from around the State. If you have shared something I haven’t used there are two possible reasons. It may be copyrighted material or I am holding it for the proper time next year. 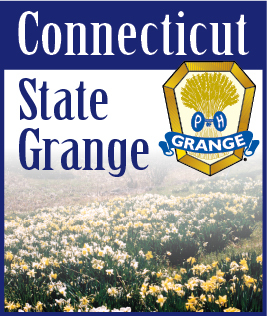 While I share what I can in my newsletter, it would be great if you visited a neighboring Grange. You can get ideas for your program and give their Grange a boost in attendance at the same time. Why not swap a program with another Grange. You may both have material the other would benefit from. Unfortunately our attendance has been falling over the last few years. Let’s do something about this before it’s too late.